I am City Councilmember Paul Koretz’ appointee to the City of Los Angeles Bicycle Advisory Committee (BAC). In 2008, City Council required “Los Angeles Department of Transportation (LADOT) and the Department of Recreation & Parks (DRP) to jointly staff the BAC, with City Planning staff.” I’ve never seen a DRP representative at our meetings, and LADOT stopped keeping our minutes years ago. So much for that. Every city department is underfunded and understaffed (okay, maybe not LADWP). What I’m reporting here – it would seem – results from the staffing and budget problems. Since I’m also understaffed (just me here), I’ve chosen to skip one of our bi-monthly BAC subcommittee meetings (where I could listen to staff reports about projects stalled or delayed or cancelled for lack of staff/funding). Instead, I will share my impressions of what my Palms/Cheviot Hills area has gotten from an LADOT Bikeways division relying too heavily on part-timers, short-timers, and interns. By the way, I personally like most of the city employees. But when things go wrong, they circle the wagons. Many are dedicated civil servants, yet all of them are also working to keep their jobs and their relationships with others in government. That said, I see no point in naming (many) names. Fortunately, despite the legal challenges, the Expo Construction Authority moved forward with train construction, creating facts on the ground the Court was less likely to undo. But Expo’s approach to the bicycle/pedestrian path was different. The Construction Authority was created to build a train, not a bike path. Sure, they could do both, but, trains! Unfortunately, when LADOT’s environmental clearance was challenged in court by my litigious neighbors, the bike path was unhitched from the train project. The city had to hire an outside contractor to redo the environmental documents and, by that time, Expo had contracted with Skanka-Rados to build the train alone. That resulted in a more costly, inferior, and indefinitely unfinished bike path. When the bike path was back on track, the city sought only one bid: from Skanska-Rados. And with all the leverage, why bid low? A package train/bike path deal was off the table; plus the builder knew exactly how much the city had to spend. So how long does it take underfunded and understaffed LADOT to build a non-controversial project like wayfinding signs? (Hey, if you’d like to ride a bike to UCLA in 25 minutes rather than driving for 30, here’s the route! Even people who don’t want bike lanes in Westwood could support that, right?) So far, it has taken LADOT more than half a decade. January 2013 (BAC Subcommittee Meeting notes) – Wayfinding doing field work to identify how to put them up. Priority is existing routes and intersections. $500,000. About 1500-2000. Asked them to send them to BAC Board Members in draft form for not distributing. October 2014 (BAC Meeting) – “Wayfinding project should have a contractor on board by end of year. [R] will be working on this.” (This is when I got in trouble for being too harsh. I (maybe unfairly) questioned new LADOT employee [R] about the delay. I was told by her boss that LADOT wouldn’t come to meetings anymore if I kept that up. July 2015 (BAC Meeting) – Caltrans working on ROW certification for 865 locations (required by Fed funding). Staffing is an excuse I have heard for years. I suppose it is valid. Apparently, the city sometimes has money, but it does not want to commit it to full-time positions. But the problem is not always staffing; sometimes, it is how the available staff is assigned. It reminds me of the city having available grant money, but not having staff to apply for it. (I digress. Again.) Sometimes, using an intern means redoing the intern’s work. Sometimes (as with the bike path environmental clearance), not using a contractor from the start costs millions and does permanent harm. Then there’s just plain CYA (look it up, if you must). I’ve been heavily involved in the push to create the Westwood Greenway, a planned natural park with water cleaning features. The greenway will be located in and along Expo, between Overland Avenue and Westwood Boulevard. It will be on strips of city land straddling Expo right-of-way. Hence it requires cooperation between city and county agencies, including LADOT, the Expo Construction Authority, and Metro. My Westwood Greenway involvement led me to ask an LADOT engineer for a report to the BAC on the path’s location. The community (Greenway steering committee, area HOA, etc.) wanted Expo to build it close to the train’s soundwalls, rather than up the middle of the open space. Better use of the space would mean 25 percent enhanced water-cleaning functions. It would also mean a shaded path. 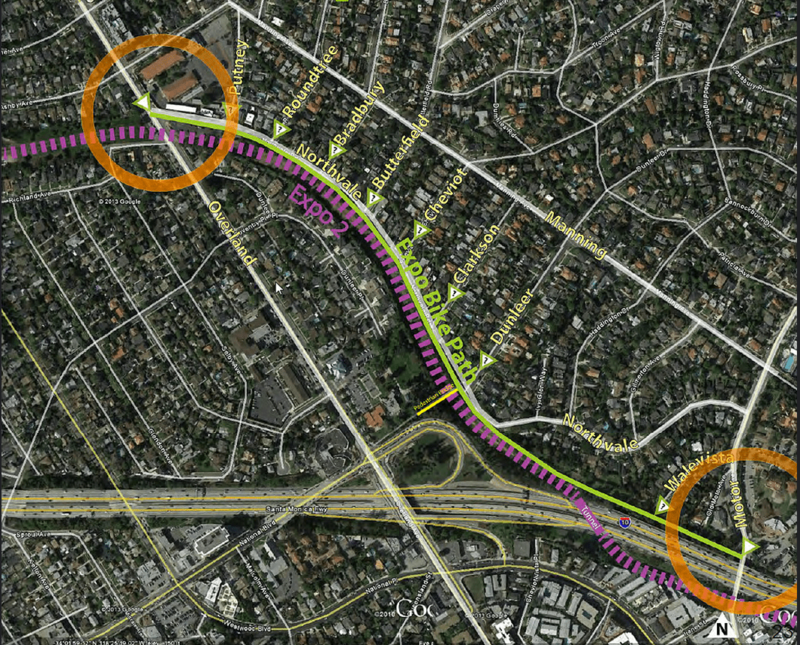 LADOT’s engineer C reported that the path would be 5 feet from the soundwalls. He was wrong. And Expo refused to move it when we found out. The BAC advised delaying the Greenway path, so did the L.A. County Bicycle Coalition. But LADOT couldn’t agree to that, probably because underfunded/understaffed LADOT wanted no responsibility for that segment, too. Jonathan Weiss practices law, lives in Cheviot Hills, and has served as an appointed representative to the L.A. City Bicycle Advisory Committee since 2009. He is also a boardmember of Streetsblog L.A.’s parent non-profit, the California Streets Initiative. No commitment, no follow through, and no care for the non-white people of LA from LADOT. Paul Koretz’s BAC appointee, I guess being Cedillo’s must be worse. The worst of it is that the section of bike path they’ve punted is the ONLY IMPORTANT PART OF THE WHOLE DAMNED BIKEWAY! There is NO way to get from Culver City to Westwood without climbing the hill between them, unless you go all the way Pico via McLaughlin and Venice. That’s why Southern Pacific made the Rancho Park cut in the 20’s, and why they fought to retain that right of way when the i10 was built. I went to many meetings and complained about the lack of reasonably graded route between CC & WW, and was placated over an over again with hollow promises. Please let the electeds know how you feel. This is a regionally significant route. Well.. that’s disappointing, because there is no way around the hill, no way to drive my bike. So I have to drive the train or my car, what means the city wins anyway, because I have to pay either way. means the city wins, because I have to pay either way. I want to like this article, but it’s really three articles in one. The primary reason the expo path through Rancho Park has not been built is because Rancho Park does not want it. Rancho Park will sue the pants off everyone they can get their hands on when that path moves forward. It was understandable when Streetsblog editor, Damien Newton mistakenly reported that the bike path wasn’t under construction. The fact that a bike path is being built is quite a surprise for anyone who pays attention to these things. 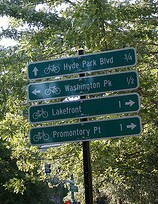 I’ve been riding the route a lot lately, thinking about how to route my family on bikes through the area. The residents of Cheviot Hills should brace themselves for a mob of people on bicycles using Northvale Road to connect between bike paths. The hill at Motor Ave is a challenge, but overall a pleasant ride. Even though the path is still under construction, I have already found it to be quicker to ride portions of the path than take the Metro 534 bus from Santa Monica to Expo’s Culver City station. (30min vs 1hr) And that’s with paying the extra 75¢ freeway surcharge! Thanks Jonathan for the report and your service on BAC. As a side note, it boggles the mind that a bike path, of all things, must undergo environmental review. What’s funny is the residents of thie little North Orange County outpost are equally hostile to cyclists on their local streets. As least that is my impression given the sort of honking and harassment I’ve experienced while making the detour. If you ride 4 feet from parked cars you will be interpreted as a cyclist who is “in the middle of the street” and be harassed, honked at and passed by a car at less than 3 feet while the driver is revving the engine in an expression of rage. What needs to happen is for cyclists to make their presence known to local residents on their “private” local streetss who will respond with outrage and realize that having us undesirables on the bike path is less offensive than in the streets of their little virtual gated community. Some sort of low level protest rides might be in order – I’d like to see a more climate appropriate version of the tweed ride with as many puppies in wicker baskets on cargo bikes as possible. can you drop some specifics? I’m in Road-Kill Gill Cedillo’s CD district, so i may as well bother someone else’s councilman, mine’s a luddite. Short term, you can encourage your state legislators to increase active transportation funding with a recent bill. http://fundingaction-calbike.nationbuilder.com/. Longer term, you can support the good work of the Mayor’s office and encourage him to spend what money we have well. Thanks for staying up to date on these issues by reading Streetsblog and sharing with your friends. Hmm…not sure if they have complaints about cyclists running stop signs. I’m going to assume that’s a general complaint that they have. Perhaps something like the Wiggle protest in San Francisco, with cyclists all riding in single file (remember, don’t ride next to each other!) making full stops at every stop sign and holding up cars behind them? With signs reading RIDING ON THE STREET SINCE WE DON’T HAVE AN EXPO BIKE PATH or something along those lines. One issue local princesses have with cyclists is that they believe they always have the right of way at a T-intersection because they are in a car. When you ride on Northvale as pass the series of streets that dead end iatT intersections you put drivers in a position where they are oppressed, or rather they have to yield the right of way to a cyclist riding on Northvale. This pisses them off. How dare you force an entitled chevoit hills princess to obey the law. Last time The Phantom looked, Cheviot Hills is in the precious Westside, not North Orange County. In fact, there has been little to no opposition to bike paths in North Orange County’s working class cities. Even the more upscale South Orange County cities, such as Irvine, are known for their miles of Class I bike paths. The Westside is where the entitled NIMBY’s live.